As a home cook and foodie my tastes and sources of inspiration are eclectic. If you eat at my house you are bound to be sampling dishes from around the world and from an endless list of resources (Internet, cookbook, blog, my own crazy concoctions . . . you name it!). One of my absolute favorite things to do is to have a day where I can wake up and make bread from scratch and then sit down and enjoy a hot slice slathered in butter. 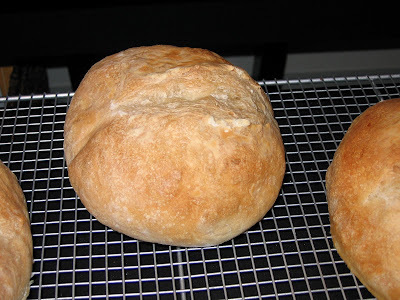 Nothing smells better than baking bread and nothing tastes better than home baked bread. Being the mother of a toddler, however, I don’t always have all of the time I would like to spend in the kitchen. Sometimes things happen and my dinner plans just aren’t feasible anymore. This situation isn’t bound to change anytime soon with #2 “baking in the oven.” Just because I sometimes have a lot less time on my hands doesn’t mean I have to give up and take my family to In-n-Out for dinner (though some days I’m all for that too!!! ), I still have options. One of those options is a source that I have successfully used in the past: Sandra Lee. If you don’t know who she is, she is a Food Network TV chef and author best-known for her “Semi-Homemade” cooking concept. She describes the philosophy as “70% store-bought/ready-made products accompanied by 30% fresh and creative touches, allowing you to take 100% of the credit.” I discovered Sandra while in law school when my “free time” was at an all-time low and was grateful for her tips that enabled me to put some yummy and beautiful looking (as apposed to chicken soup from a can or nothing at all) dishes on the dinner table for Mr. Fuji and I.
I’ll be at the evening event in Glendale. If you’re going to be there, give me a shout out, I’d love to see you! *For other book tour dates and locations, go here. *To check out what all the hype is about, see some of Sandra’s recipes here, here, and here. I love the new look to your blog! And I live sandra lee. I need to pull my head out of the bee hive! I had NO idea you had another loaf in the oven! Congrats girl! So seriously…I won 3 handmade bibs this past week from a fantastic site called three-peas.. but they are for a girl.. you want them? Or are we having a chipmunk instead of another squirrel? I love the new header too. I’ve heard of Sandra Lee, but never tried her stuff before. I’ll have to check it out. I love the 70% 30% concept! These “paid to blog” posts are pretty disappointing. I was sad to see you leave Japan, because your posts were so much more interesting then. These are just pathetic. Next post: Looking for me?